I have added a new soap bar to my fav summer bath essentials and would like to let you read about the same. 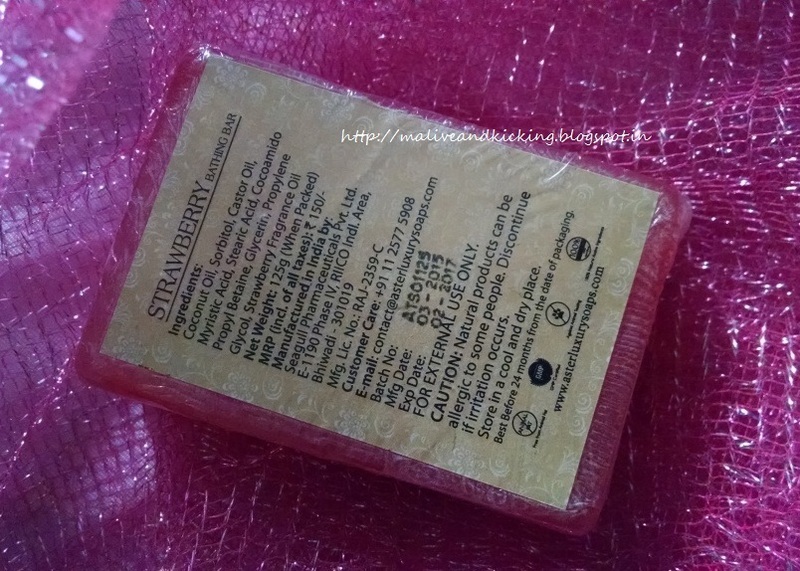 It is the first luxury soap in Strawberry variant that I have tried from wonderful range of Aster Luxury soaps that is infused with fabulous strawberry scent and moisturizing glycerine. Aster Luxury handmade bathing bars are premium bathing soaps which are designed for those who want to nourish their skin naturally. Aster bathing bars are blended for enhancing specific skin types, as every individual's skin is not the same. These luxury soaps are skin healthy, soothing and provide natural protection to the skin. 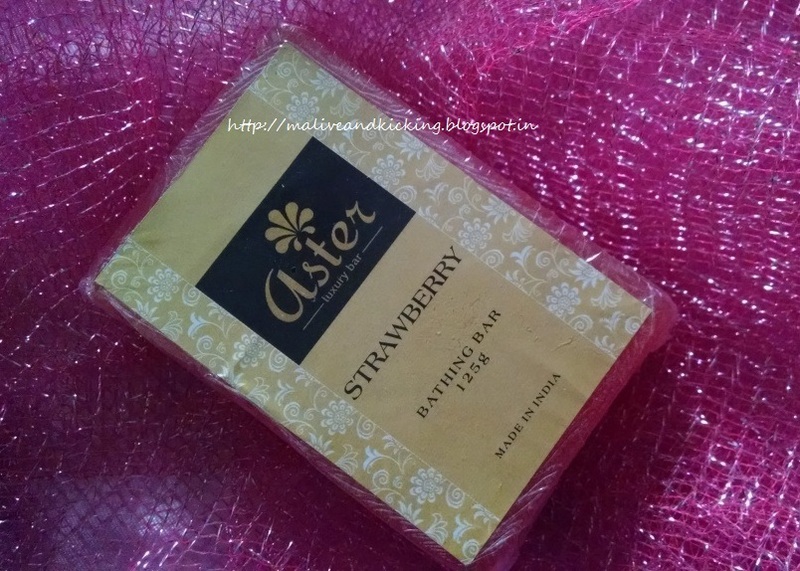 Aster bathing bars retain all the possible benefits of herbs and essential oils. The Essential Oils & Fragrances used in Aster Luxury bathing bars are sourced from authentic manufacturers & used only after going through stringent quality control methods. Aster handmade soaps use good percentage of essential oils thus the lingering fragrance lasts much longer. Usage:Firmly hold the aster handmade bathing bar and run all over the wet body. This soap gives good lather that will clean your whole body. Apply lather all over body before showering off. Coconut Oil, Sorbitol, Castor Oil, Myristic Acid, Stearic Acid, Cocoamido Propyl Betaine, Glycerin, Propylene Glycol, Strawberry Fragrance Oil. Price: Rs.150/- for each bar weighing 125g. Packaging: The soap comes double-sealed in a transparent film so you are greeted with the lovely soap color directly from outside even before you could open it. The packaging has sticker with their brand logo on the front and ingredient list at the back of the soap. The moment you rub the soap on your body, it produces decent lather. 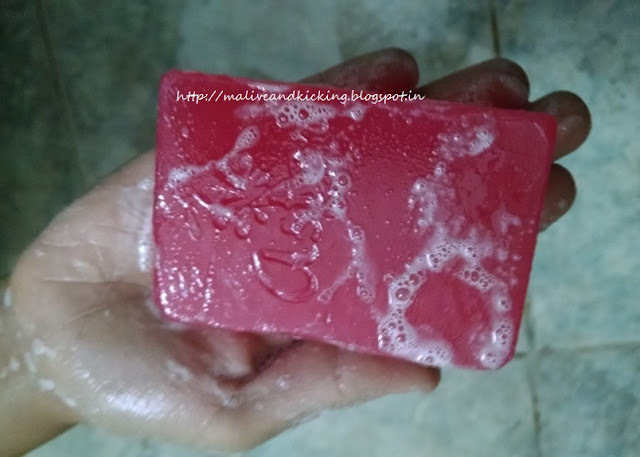 The lather may not match with usual chemical based soap bars because the soap bar is enriched with glycerine. But I am perfectly happy with it. 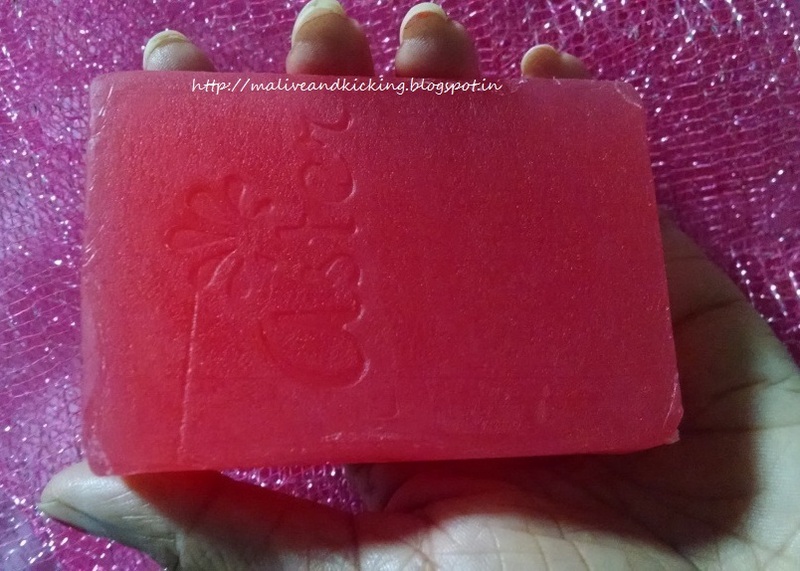 The soap caused me no itchy or inflamed feel on skin. Interestingly, the soap bar doesn't slip from your hand after being contacted with water and gives you fine grip. There is no tendency of quick melting in the soap bar like other handmade soaps, but even them I am making it sure that it doesn't remain wet after bathing. Strawberries are known for anti-ageing properties and help condition the skin. So you skin is in for a treat. May cause dryness for extremely dry skinned people. Overall thoughts: Everyone who loves to eat strawberries would love to wash with this strawberry soap rich in vitamin C that will make your skin feel soft, supple and deeply cleansed. Nice review!!! such a vibrant color.